New York city might have destroyed the best railroad station the world has ever seen when it demolished McKim, Mead & White’s 1910 Penn Station in the 1960s, but the good news is that it wasn’t the only Penn Station that McKim, Mead & White designed. On the other side of the Hudson River, is the city of Newark (New Jersey), and the Penn Station there is alive and well. 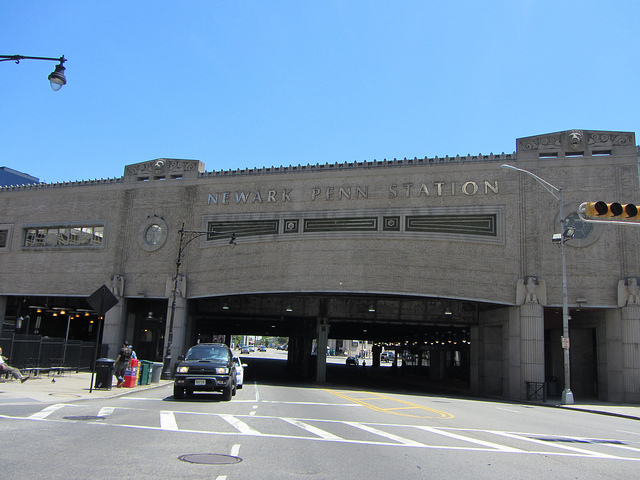 Newark’s Penn Station opened in 1935, a quarter of a century after New York’s, and it was McKim, Mead & White’s last major building. Built for the Pennsylvania Railroad (hence the name), and replacing an earlier station, it’s a lot smaller than its gargantuan New York predecessor. It is less palatial and grandiose, architectural tastes having changed in the intervening 25 years, but it’s a glamorous survivor nonetheless. I ended up there last year by accident. Having flown into Newark Airport, I had been planning to catch the AirTrain monorail (I do like a nice monorail) from the airport to Newark Airport station on New Jersey Transit’s railroad line into New York city. Unfortunately the monorail was closed for repairs so I was herded onto a rail replacement bus. This considerably alleviated any culture shock I might otherwise have felt in America, by presenting me with exactly the kind of unexpected bus substitution that ruins many a train trip at home. With confused and disgruntled passengers milling around and trying to work out which bus they needed to catch (as well as fending off overtures from cab drivers trying to pick up their business) it was just like home. On the plus side, the bus didn’t drop me off at Newark Airport station, but took me all the way to Penn Station instead. 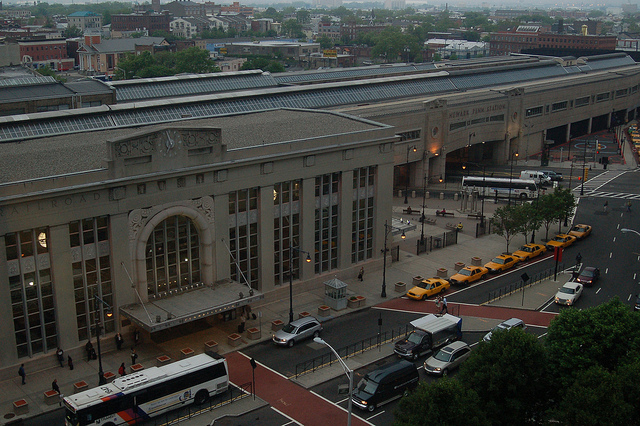 Penn Station’s main entrance is on the north side of the tracks, where a two-storey station house projects out from the elevated tracks of the railroad itself. Most of the rest of the passenger facilities at Penn Station are in a single storey tucked under these tracks, so this is the tallest and brightest part of the station building. 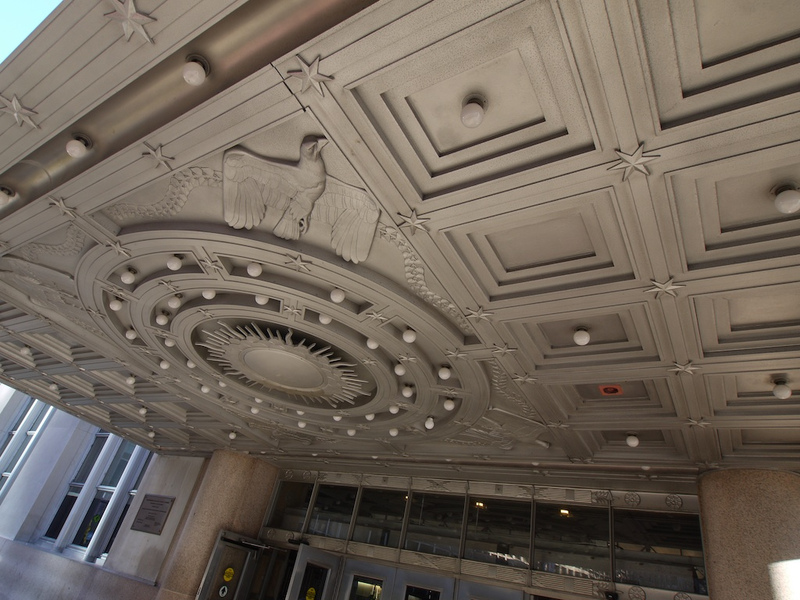 The materials in which Newark Penn Station are finished – limestone with pink granite detailing – are similar to those which faced New York Penn Station. 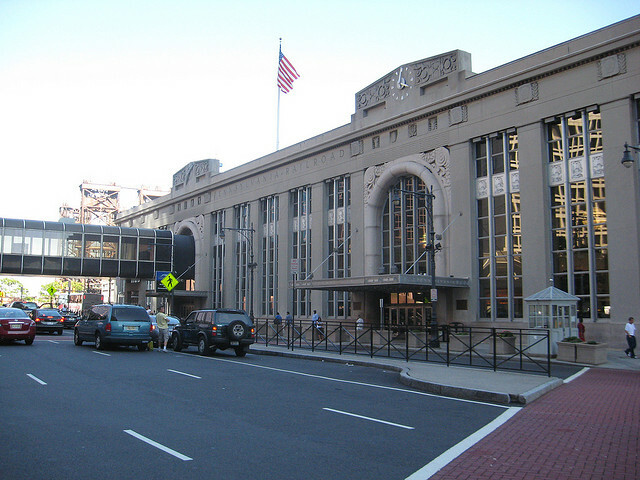 But while New York Penn Station was a neo-classical palace, Newark Penn Station was and is an Art Deco building. Two tall entrance arches (in pink granite) dominate the main façade, one with a clock on the pediment at the top and one with a stylised zodiac motif. This interest in things astronomical and astrological was a recurrent theme in American Art Deco. You can see it on the Chrysler Building (New York, 1930) with sun/star-burst patterns around the base of its spire, and at the Hoover Dam (1936) where the dedication monument features a brass and terrazzo astronomical map rendered with beautiful Art Deco lettering. 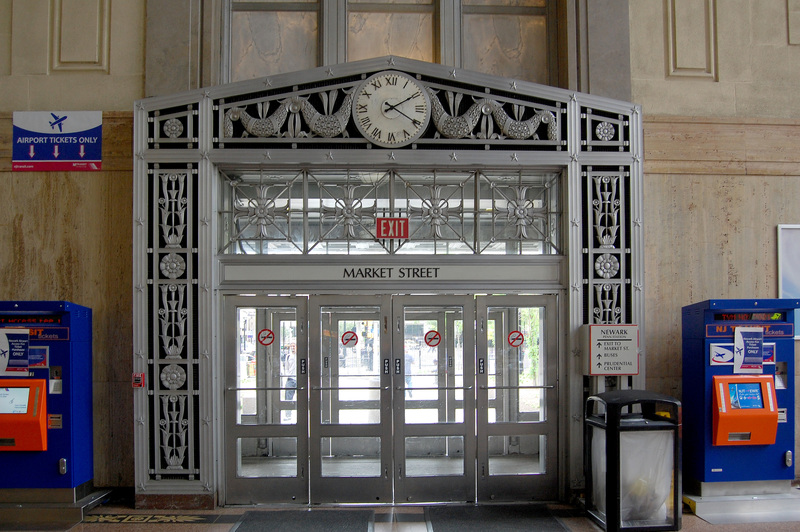 Penn Station’s right-hand arch (as you look at it from the outside) leads into the station’s main waiting room, while the left-hand one used to lead into a two-storey lobby which gave access either to one of the concourses which run under the railroad tracks, or to the waiting room, or to the bus station attached to the railroad station. Unfortunately that room has been thoroughly knocked about by the installation of a modern elevated walkway, built in 1972, which links the station to a nearby hotel. Some philistine allowed the walkway to exit the station building through the upper part of the entrance arch, like an arrow stuck into the eye of an old friend. It’s really the only unsatisfactory thing about the façade. Like a lot of Art Deco buildings, Penn Station features a great deal of shiny metal. Practically all such metal in this case is (and in deference to the station’s home I shall use the American spelling) aluminum, set off rather well by the muted colours of the stonework. It runs as mullions up and down the windows, and across the building as a line of decorative square panels high up on the windows. It is also used for the canopies which shelter the station’s doors; two on the front, one at the end. This is the point at which the (slightly jet-lagged in my case) passenger realises they have stumbled across a remarkable Art Deco survivor. 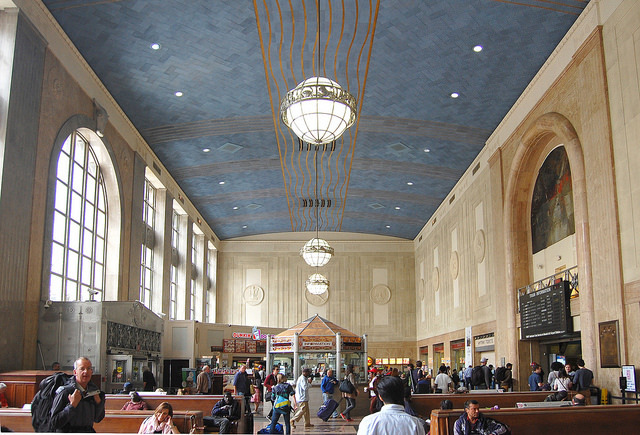 The canopies are edged with the station name, and typical Art Deco geometric patterns. Underneath, the canopies are even more spectacular, featuring a stylised rendition of the solar system. Through the door under the right-hand canopy is the main waiting room, which is the architectural highlight of the station; the inside surpassing the outside. For a start this large hall (it’s 40ft / 12.2m tall) is beautifully proportioned, with a gently curved roof. It feels for all the world like the inside of a jewellery box, so much so that you half expect to find a scaled-up clockwork ballerina gently pirouetting in the middle of the waiting room, rather than the kiosk which actually occupies the space. To further the analogue, the ceiling is decorated in blue-painted acoustic panels (designers of noisy modern stations please take note), relieved by gold leaf patterns, like a jewellery box’s lined interior. As with most jewellery boxes, shiny trinkets are to be found within. Hanging from the ceiling are four extraordinary globe chandeliers (two are original, two are reproductions replacing originals lost in 1957). They are made of opal glass, and each one is surrounded by a white-bronze ring detailing the signs of the zodiac. These are three-dimensional versions of the astrological motif on the façade of the station. In conjunction with the chandeliers, it doesn’t take too much imagination to see the gold leaf on the blue ceiling as an abstract representation of the Milky Way in the night sky. High up on the walls of the waiting room are relief medallions illustrating the history of transport, originally coloured but now in plain stone-colour. The floor, meanwhile, is of red terrazzo with black and yellow floral motifs. From the station’s main building, two concourses lead under the railroad tracks where more aluminum detailing can be found, and staircases then give access up to the main trainshed and platforms. The walls of the trainshed, the outsides of which can be seen from the roads around the station, are also of limestone, featuring green terracotta decoration. 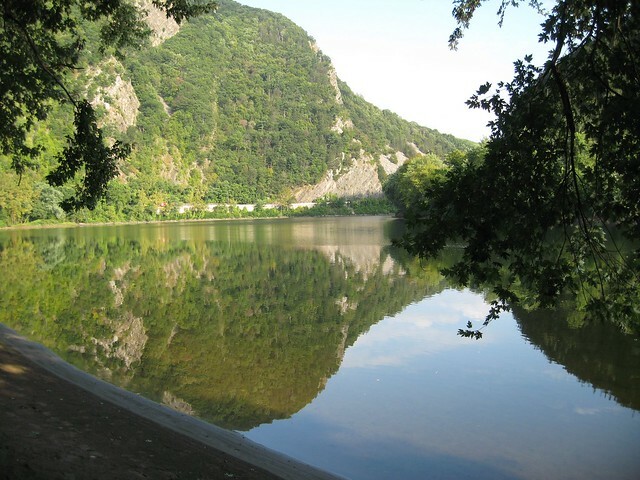 Where the station straddles local roads there are archways flanked by double pillars and topped by eagles (McKim, Mead & White liked eagles, and there were many earlier eagles at New York Penn Station) and a lion’s head in relief above those. The name of the station runs across the archways in cast aluminum lettering. Up on the platforms however, Penn Station perfectly illustrates the dichotomy which can be found across the American railroad system, in which well restored or modern facilities sit alongside run down ones that have clearly seen better days. The platforms at the station have immense potential, but seem to have escaped the restoration programme that restored the lower parts of the station in the late 1990s, and they feel as though they are in need of some TLC. 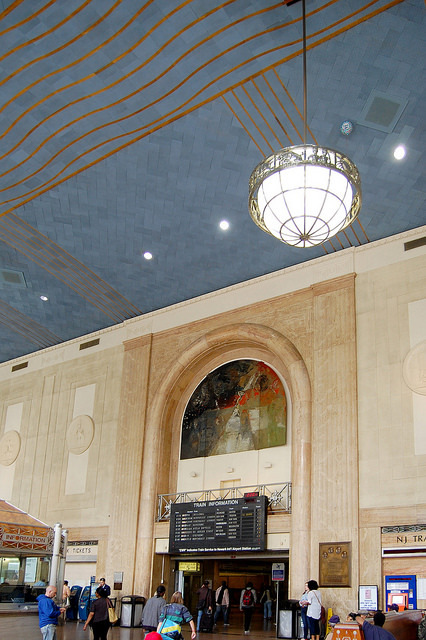 Because the station was designed for the Pennsylvania Railroad’s electric trains, the roof could be fully enclosed, and to bring light into the station, long skylights were designed with bell-shaped steel beams. Their design is extremely appealing, and if they were thoroughly restored in the way that the roofs at many major British stations have been, the platforms could be just as spectacular as the lower levels. That, however, is a minor complaint given the wonders downstairs at Newark Penn Station. If it is a matter of ongoing regret that New York let its Penn Station slip away, at least we can be cheered by the fact that Newark hung on to its Penn Station, ensuring that McKim, Mead & White’s work in this field remains well-represented. The National Park Service’s National Register of Historic Places write-up for Newark Penn Station, here. It dates from 1978 and so doesn’t include details of the late 1990s restoration, but it does have some really useful drawings of the station layout. Amtrak’s Great American Stations webpage on Newark Penn Station, here, which is more up to date. 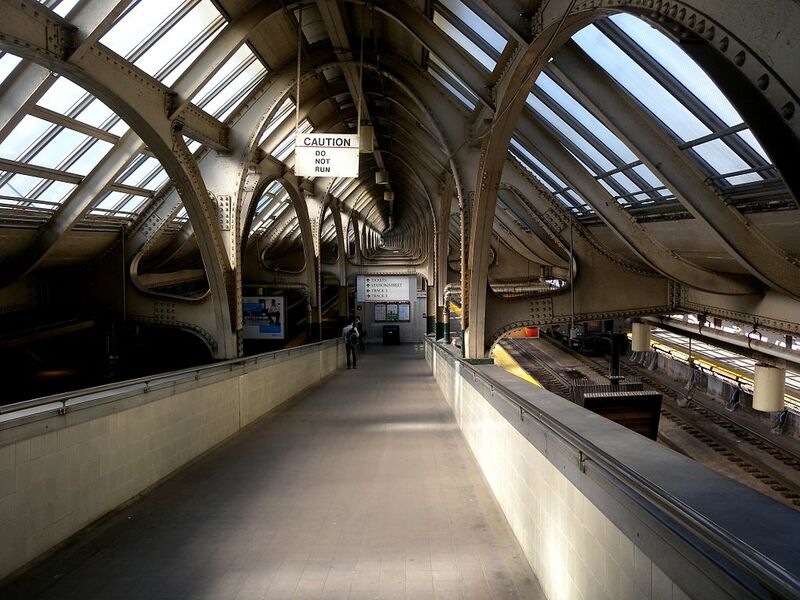 Thanks for this week’s post; it has particular resonance for me since I grew up in that area, and have been going through Newark Penn off and on since the late 1950s! I have a few photos of it on my Flickr site, but none as good as those you have chosen (for all I know you may have already researched mine and rejected them!). Flickr has made yet another change, I cannot work out how grab a link to an individual photo. Grr! The Newark Subway was developed in 1935, AFTER the decision was made to convert all the rest of Public Service’s extensive tram and light rail lines to bus operation! Thanks, I hadn’t realised how beautiful the station is, having only passed through from the Newark Airport monorail to the PATH subway. There were some of the original art deco building corridors I went through, but there was also the typical US insensitive changes, rooms added etc, that did not suggest that there was much else of the original building to see. I must say though that the PATH subway stations in Manhattan are dreary, even more so than Drain stations.